Instead of a snow storm threatening to derail your dinner plans, imagine being able to dine on Canadian beef overlooking the crystal clear waters of the Caribbean as palm trees sway in a gentle breeze. On the second week of each month guest chefs work with the talented team of Michelin star restaurant-trained chefs and sommeliers at Karisma Hotels & Resorts for The Canadian Beef Culinary Series. 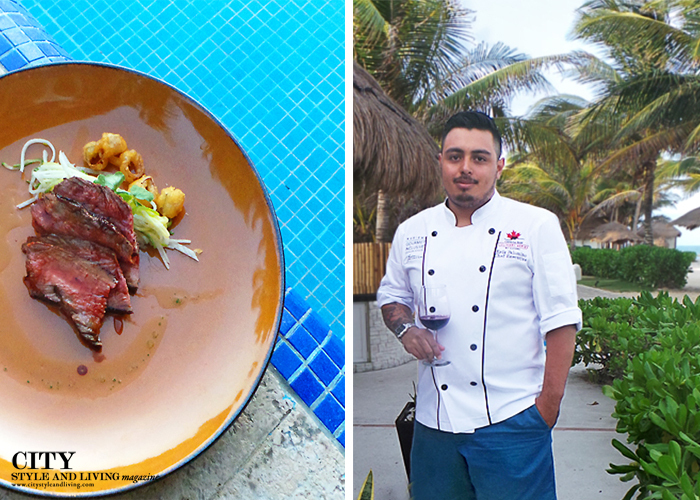 The weeklong program at El Dorado Royale A Spa Resort, by Karisma, an adults-only Gourmet Inclusive property in Riviera Maya, Mexico kicks off with a beachside barbecue, and makes beef the star ingredient. This is a hands-on series allowing guests to learn about how to prepare different beef cuts, chat with chefs, dine at an exclusive chef’s dinner and discover new wine and food pairing suggestions from sommeliers. Best of all you can spot some local talent. Chefs from cities across Canada will be sharing their culinary talents with guests throughout 2015, including Chef Jonathan Gushue from Toronto and former Top Chef Canada participant Chef Todd Perrin. In fact, Calgary Chef Paul Rogalski, owner of Rouge Restaurant in Calgary, will be featured this November. Offered exclusively at Karisma Hotels & Resorts, guests are invited to discover The Canadian Beef Culinary Series, by Karisma at an additional cost of $300 for the weeklong program at El Dorado Royale; a la carte rates for wines and ad hoc wine and culinary experiences at the entire collection of Karisma Hotels & Resorts start at $35. This travel article first appeared in the Fall 2015 issue of City Style and Living Magazine.